We imagine facts to support what we believe. That’s a problem because politicians tend to focus on what we believe, not the actual data. It’s the same in every country. This global survey by Ipsos MORI, key findings of which are summarized here, highlights how wrong we are in 14 countries about the make-up of our population. Emotional innumeracy is the root of the problem, a term from a research paper by Daniel Herda (UC Davis) who studied immigration innumeracy, the inability to reason about immigration. So, if we believe immigrants pose a threat, we overestimate the immigrant population. Fear drives our overestimate; the overestimate increases our fear. US respondents imagine that immigrants make up almost a third (32%) of our population, two and a half times the actual number, 13%. Immigrants are perceived to be a threat in all nations surveyed, and the smaller the actual percentage of immigrants, the greater the overestimate. The miniscule 0.4% of Poland’s population who are immigrants are overestimated at 35 times that number, Hungary’s 8 times, Japan’s 4 times and so on. 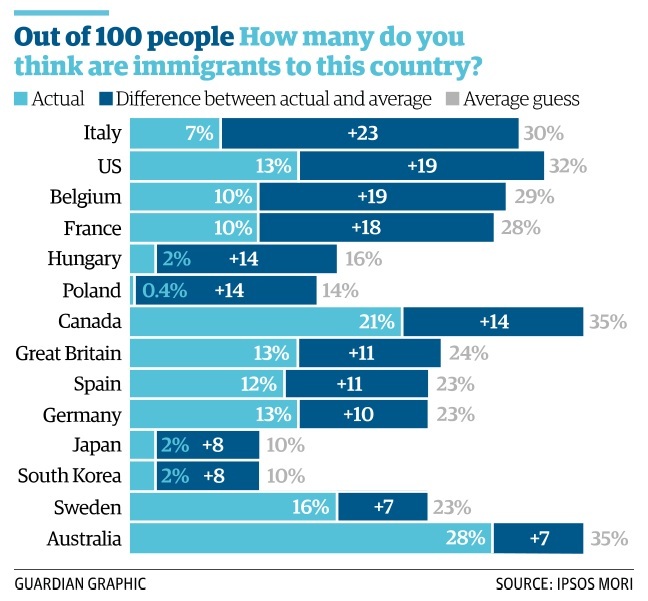 Australians with by far the highest percentage of immigrants (28%) overestimate by only a quarter. 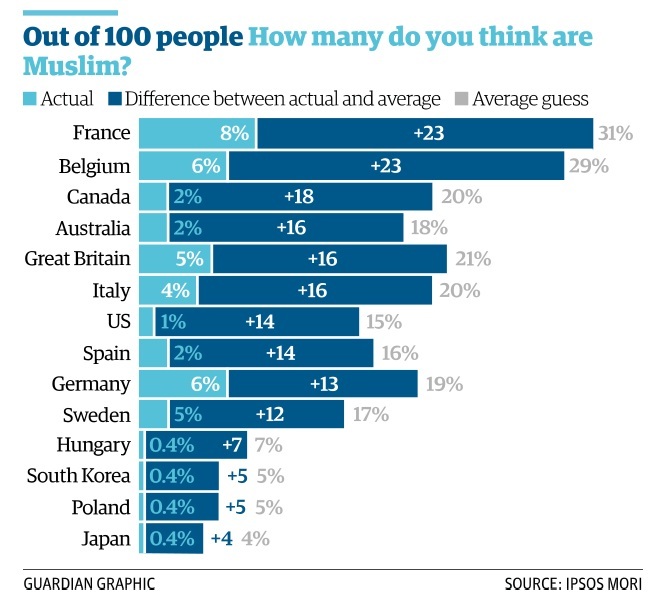 The percentage of Muslims is also universally overestimated. The overestimate of our Muslim population by US respondents is 15 times the 1% small reality. That is consistent with the overestimation in other countries with small (2% or less) Muslim populations – Hungary 18 times, South Korea and Poland 13 times, Canada and Japan 10 times, Australia 9 times, Spain 8 times. But even in countries with a more noticeable 4% – 8% Muslim population the overestimates are at least 3 times reality. The percentage of Christians is correspondingly underestimated in most countries. Four of every five (78%) Americans report themselves to be Christian while we estimate it is less than three in five (56%). Even in Italy where 83% of the population is Christian, the estimate is only 69%. These underestimates result from perceived threat to that heritage. 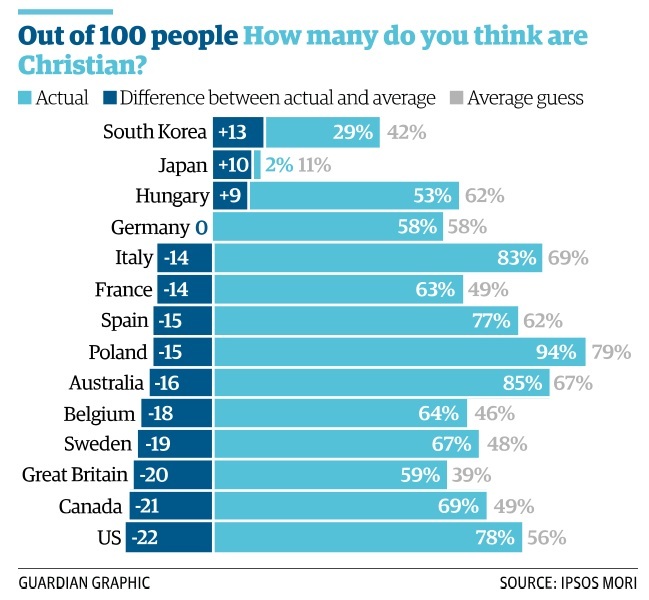 The percentage of Christians in South Korea and Japan is hugely overestimated. These overestimates also result from perceived threat to their traditional culture. Overestimates of immigrants and Muslims and underestimates of Christians all stem from the perception that traditional values, culture and identity are under threat. We might question the “actual” count of Christians in the following chart because many who do not go to church consider themselves Christian, but the feeling of threat is to whatever respondents consider themselves to be. 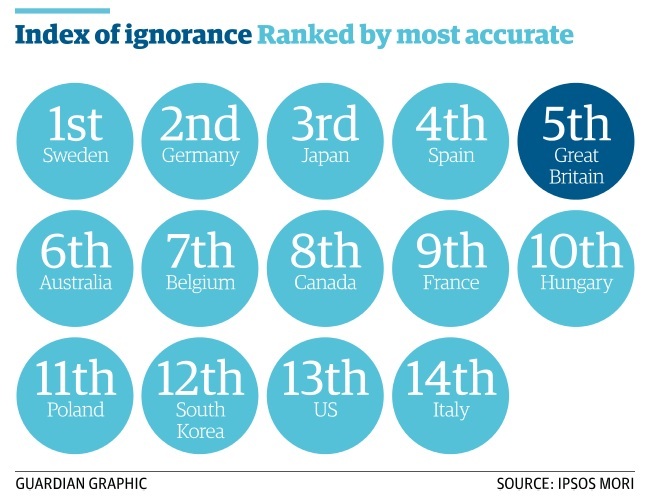 Sadly, we in the US are almost the most ignorant and/or fearful of all nations. Only in Italy is there greater ignorance and/or fear of change. Eighty years ago in his first inaugural address, our President spoke of his “firm belief that the only thing we have to fear is fear itself—nameless, unreasoning, unjustified terror which paralyzes needed efforts to convert retreat into advance.” That, too, was a time to get real. “Only a foolish optimist can deny the dark realities of the moment,” he went on. But we can’t get real if we keep imagining the facts and getting confirmation of our fears from media whose interests are so different from ours. So let’s stop deluding ourselves. Let’s question what we imagine to be facts.